Lumberton is a city in Robeson County, North Carolina, United States. It is the county seat of Robeson County, which is the largest county in the state by land area. Located in southern North Carolina's Inner Banks region, Lumberton is located on the Lumber River. It was founded in 1787 by John Willis, an officer in the American Revolution. This was developed as a shipping point for lumber used by the Navy, and logs were guided downriver to Georgetown, South Carolina. Most of the town's growth took place after World War II. The City of Lumberton was created by an Act of the North Carolina General Assembly in 1787 and it was named the county seat of Robeson County. Lumberton was incorporated in 1859. 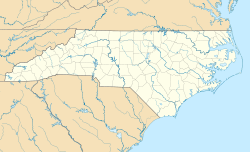 Robeson County is located in the Coastal Plains region of southeastern North Carolina. The county was created from Bladen County in 1786 by two American Revolutionary War heroes and residents of the area, General John Willis and Colonel Thomas Robeson. The county was named after Colonel Robeson and the land for the county seat was donated by General Willis, who is credited with naming the county seat as Lumberton. The area was a frontier destination for both white and numerous free families of color from Virginia in the late eighteenth and early nineteenth centuries. Many free blacks were descendants of white women (who were free) and African men, whether slave, free or indentured, from the colonial years, when working classes lived and worked near each other. The County has a high proportion of residents who identify as Lumbee: they have been recognized as a Native American tribe by the state of North Carolina have been recognized as a tribe by the Federal government; however, without federal benefits (money) because no known treaty (contract) exists between Lumbee Indians and the US government that would entitle them to federal benefits according to Dr. Ben Chavis. In short, the Lumbee Indians were never defeated in a war or removed from their land by the United States government. For four seasons, 1947–50, Lumberton fielded a professional minor league baseball team in the Tobacco State League. Affiliated with the Chicago Cubs, the team was known as the Lumberton Cubs in 1947 and '48, and the Lumberton Auctioneers in 1949 and '50. Established in 1912, the Robeson County Health Department is recognized as the oldest rural health department in the nation. Its current headquarters is on the outskirts of Lumberton. In 1970, Lumberton was named an All-American City, presented by the National Civic League. It became a two-time winner in 1995 of this award which recognizes those whose citizens work together to identify and tackle community-wide challenges and achieve uncommon results. David Lynch's film Blue Velvet (1986) was set in Lumberton, though it was filmed about 70 miles (110 km) southeast in Wilmington. This situation raised some problems during filming, so Lynch filmed a small sequence in Lumberton and was subsequently allowed to use the name. In 2010, the North Carolina Legislature designated Lumberton as THE FIRST Certified Retirement Community in North Carolina. This certification signals that Lumberton offers an unprecedented quality of living and range of amenities, services and opportunities which make it desirable to retirees. This program captured the Governor’s Innovative Small Business Community Award in 2011. The Baker Sanatorium, Luther Henry Caldwell House, Carolina Theatre, Humphrey-Williams Plantation, Lumberton Commercial Historic District, Planters Building, Robeson County Agricultural Building, Alfred Rowland House, and US Post Office-Lumberton are listed on the National Register of Historic Places. Lumberton is located at 34°37′38″N 79°00′43″W﻿ / ﻿34.627239°N 79.011947°W﻿ / 34.627239; -79.011947. According to the United States Census Bureau, the city has a total area of 15.8 square miles (40.9 km2), of which 15.7 square miles (40.7 km2) are land and 0.1 square mile (0.2 km2) (0.44%) is water. Lumberton is located on the Lumber River in the state's Coastal Plains region. The Lumber River State Park, 115 miles (185 km) of natural and scenic waterway, flows through Lumberton. The river was designated as a National Wild and Scenic River and is part of the North Carolina Natural and Scenic River System. The Lumber River has been classified as natural, scenic and recreational. Recreation includes canoeing and boating, fishing, hunting, picnicking, camping, nature study, swimming, biking, jogging, crafts and fossil and artifact hunting. Lumberton is served by Interstate 95 and Interstate 74. In 2018 Lumberton experienced extensive flooding from Hurricane Florence. 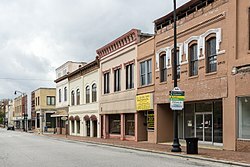 Lumberton is the larger principal city of the Lumberton-Laurinburg CSA, a Combined Statistical Area that includes the Lumberton (Robeson County) and Laurinburg (Scotland County) micropolitan areas, which had a combined population of 159,337 at the 2000 census. As of the 2010 United States Census, there were 21,542 people residing in the city. The racial makeup of the city was 39.0% White, 36.7% Black, 12.7% Native American, 2.4% Asian, 0.1% Pacific Islander, 0.1% from some other race and 2.2% from two or more races. 6.7% were Hispanic or Latino of any race. As of the census of 2000, there were 20,795 people, 7,827 households and 5,165 families residing in Lumberton. The population density was 1,322.4 people per square mile (510.8/km2). There were 8,800 housing units at an average density of 559.6 per square mile (216.1/km2). The racial makeup of the city was 48.54% White, 35.44% African American, 12.79% Native American, 0.91% Asian, 0.03% Pacific Islander, 1.18% from other races and 1.11% from two or more races. Hispanics or Latinos of any race were 3.30% of the population. Of the 7,827 households, 32.2% had children under the age of 18 living with them; 38.8% were married couples living together; 23.0% had a female householder with no husband present, and 34.0% were non-families. 29.9% of all households were made up of individuals and 12.6% had someone living alone who was 65 years of age or older. The average household size was 2.44 and the average family size was 3.01. Children of high school age (grades 9-12) attend Lumberton High School, which is run by the Public Schools of Robeson County, as it is in Robeson County. The city's population was spread out, with 26.3% under the age of 18; 9.3% from 18 to 24; 28.2% from 25 to 44; 21.3% from 45 to 64; and 14.8% who were 65 years of age or older. The median age was 35 years. For every 100 females, there were 89.1 males. For every 100 females age 18 and over, there were 85.8 males. The median income for a household in Lumberton was $26,782, and the median income for a family was $33,839. Males had a median income of $28,903 versus $24,503 for females. The per capita income for the city was $15,504. About 23.9% of families and 25.9% of the population were below the poverty line, including 38.4% of those under age 18 and 23.7% of those age 65 or over. Velma Barfield (1932-1984), serial killer who murdererd six people, born in South Carolina and Lumberton resident. ^ Holaday, Chris (2016). "The Tobacco State League; A North Carolina Baseball History, 1946–1950". . Jefferson, N.C.: McFarland. ISBN 978-1-4766-6670-9. ^ department, health. "Robeson County NC Health Department". publichealth.southernregionalahec.org. Retrieved 3 April 2018. ^ "National Register of Historic Places Listings". Weekly List of Actions Taken on Properties: 4/16/12 through 4/20/12. National Park Service. 2012-04-27. ^ "Contact Us / School Contact Numbers". This page was last edited on 20 February 2019, at 18:00 (UTC).